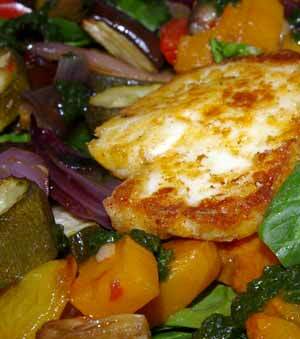 roasted vegetable salad is a favourite of mine and, having discovered quite how much i like it dressed with basil oil, i often make up a large batch to have with fried halloumi, as a packed lunch. it is also delicious as a simple supper, served with couscous or fresh crusty bread. the recipe really isn’t very complicated and is easily adapted according to what vegetables are in season or you happen to have in. the vegetables in this salad were courgettes (cut into 1cm coins), red and yellow peppers (deseeded and cut into bite-size pieces, red onions (thinly sliced), aubergine (cut into 2cm cubes) and butternut squash (cut into 1 cm slices/cubes). i pile my vegetables into a roasting tray, drizzle with olive oil and balsamic vinegar, season and roast at 200c until all the vegetables are soft, turning every 15 minutes or so. these are left to cool and served with drizzled with basil oil ( fresh basil blitzed with good olive oil, a little garlic and some salt & pepper) and topped with fried halloumi (dust slices of halloumi with some flour seasoned with smoked paprika and fry in a little olive oil until golden on both sides). easy and delicious!